Das Buch auf Englisch mit DVD erschien 2009 zum 20. Geburtstag des Rainbow Projects. 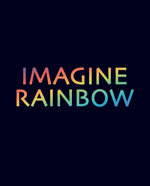 imagine rainbow ist eine Weiterentwicklung der deutschen Ausgabe «Der Erste Regenbogen Katalog» 1999 und stellt auch die Arbeit des Rainbow Projects während der letzten 20 Jahre vor. Das Buch enthält eine DVD mit sieben Filmen. Mehr informationen zur DVD hier. The book embodies: The creative spirit of the present with its wealth of images, ideas and fields of experience. Portraits of initiatives and innovators with their meaningful and diverse projects. Snapshots of a developed yet ever-growing fleece. The rainbow: A timeless unifying symbol in the fables, myths, religions and visions of mankind, in science, art, dreamtime and in our everyday lives. 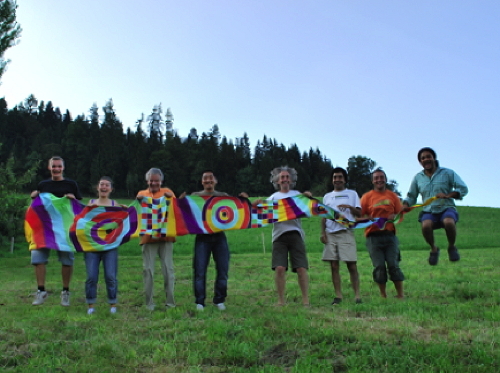 The Rainbow Project: Worldwide projects with Umbul Umbul Flags in the colours of the rainbow; the red thread representing the unity in the diversity of cultures. Information, stimulus, entertainment and association. Motivation for discussion and, above all, impulses and inspiration for creative activities. «Für alle Menschen, die sich inspirieren lassen wollen, ihre Träume zu leben.» Spuren, Herbst 2010. Mehr Bilder zur Buchvernissage im Sandacker hier. The book was introduced by Professor Abhi Subedi. Mehr Bilder zur Buchvernissage in Kathmandu hier. 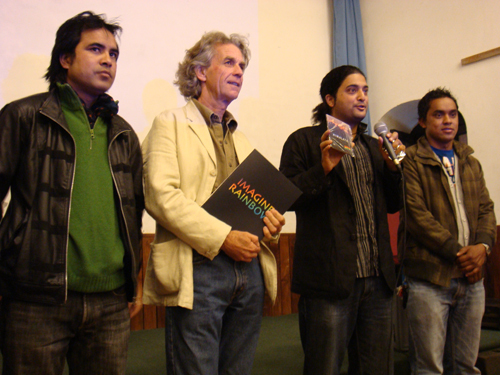 "The CD Himalaya, on the other hand, is a project by IRIK which was established by Salil Kanika, Shyam Nepali and Thomas Bertschi in 2006. Himalaya carries a single track which is 12 minutes long. It is the work of many artists and musicians of Nepal." Republica, 12.11.2010 Mehr information zur CD hier.